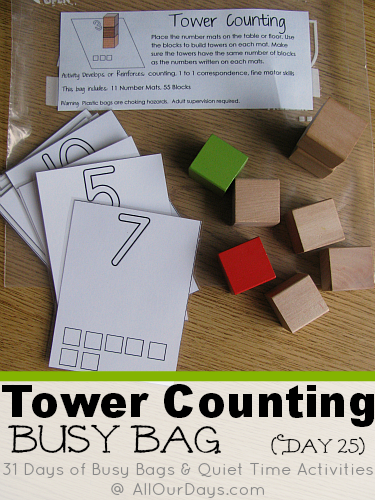 These Tower Counting cards are for numbers 0 through 10. Each card has a number outline at the top (your kiddos could color it) and squares along the bottom to show the number (those could be colored, too). 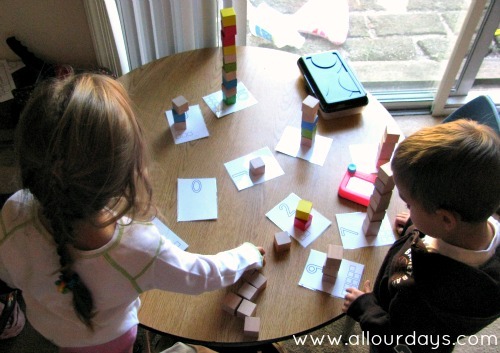 This way children could read the numbers or count the boxes to figure out how many blocks they need in their tower. We laminated the cards for more durability. You can have your child build one tower then take it down to the build the next, in which case you’ll only need 10 blocks. If you have a larger block collection, 55 blocks will build all the towers. We simply give the kids the busy bag and they know to get the bin of wooden blocks. 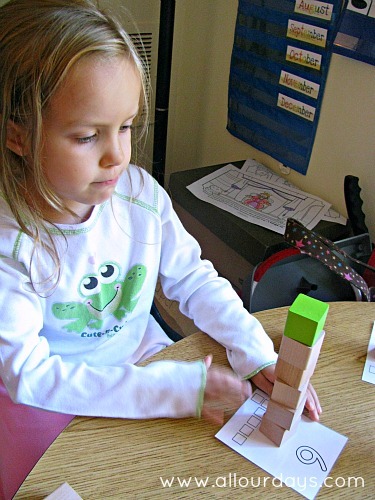 Our kids use all square blocks so they can accurately compare tower sizes. Our wooden blocks are similar in size to these Melissa & Doug blocks. You could also use square Duplo or Lego bricks, or even homemade branch blocks (I’m hoping for some for Christmas). Unfortunately, the square foam blocks we used in our Block Puzzles Busy Bag do not work for this activity because the blocks topple when you get to the higher numbers. Click the link below to download this free printable busy bag label. What other ways do you practice counting with your children? 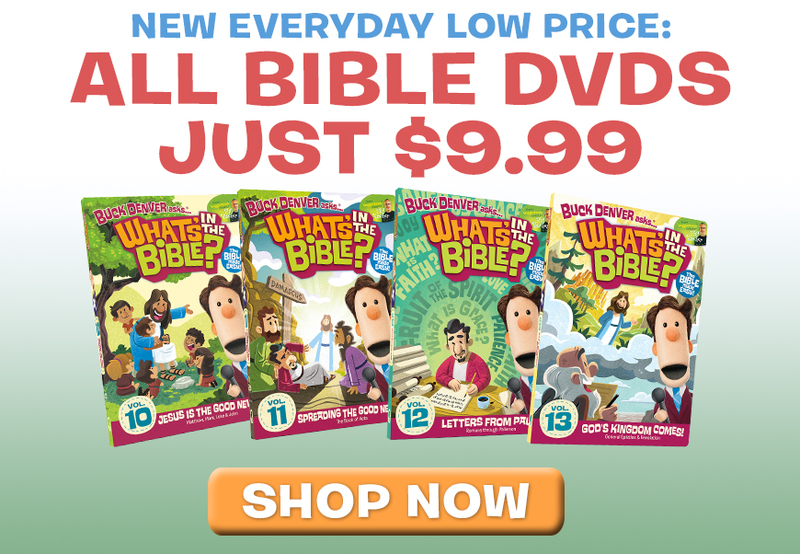 Leave us a comment below. Merci beaucoup pour votre partage, mes enfants y ont joués ce matin , ils ont beaucoup aimés. Lovely unexpensive and sooooo simple ideas!Just wonderfull! Thanks for sharing! This is great; my little guy loves blocks!